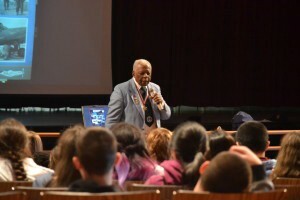 Students at Harrington Middle School were flying high on March 8 when they got a chance to meet former Tuskegee Airmen pilot Dr. Eugene Richardson. Thanks to a donation from the Mt. 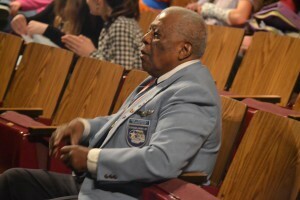 Laurel Public Education Fund, Richardson spent the morning at Harrington speaking about his life as one of the Tuskegee Airmen with a group of students who had previously researched the airmen and their role as the first African-American military aviators in the United States Armed Forces. The former pilot touched on a broad range of topics, from discrimination the airmen faced to the planes they flew to their accomplishments during the war to the growing roles African-Americans and women had over time in the field of aviation and the United States Armed Forces. In addition to the history lessons, Richardson used his own life as an example when he told the students anything was possible as long they had three words that each started with the letter “D”. “You need a dream, you need a desire to make that dream real, and you need the discipline to make yourself stay on track to do what you need to do to make your dream real,” Richardson said. To that point, Richardson’s own dream of flying predates the creation of the Tuskegee Airmen to the 1930s when he was still a child living in Ohio. There Richardson first saw the “Colored Air Circus,” an airshow performed with all African-American pilots, and it was then Richardson found his dream of taking to the skies above. In 1944 when Richardson turned 18 he went for pilot training at the Tuskegee Army Air Field, which he successfully completed in March of the next year. However, Richardson was never deployed due to the end of the war later that spring, and he was discharged in 1946. As positions for black aviators were still nearly nonexistent at that time, Richardson instead chose to pursue a career in education through the Philadelphia school system. 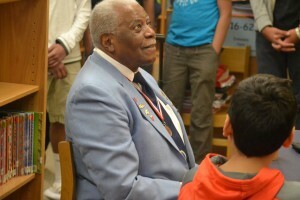 To this day Richardson still has that love of education, as he regularly visits area schools to share the history of the Tuskegee Airmen. When one Harrington student questioned Richardson on his feelings about the historical impact the Tuskegee Airmen, Richardson said at the time of the war he had no way of knowing the airmen would eventually factor so greatly into President Harry Truman’s decision to desegregate the nation’s armed forces in 1948. “We just did the best we could for ourselves and for social relations,” Richardson said. One example Richardson shared with students was that of Benjamin O. Davis, Jr, who commanded the 332nd Fighter Group made up of Tuskegee graduates and who later became the first African-American general officer in the United States Air Force. Richardson told students that during World War II Davis was eventually able to name his plane “By Request” because the Tuskegee Airmen were so successful in their role escorting bombers that white pilots would specifically request their aid. “At first they didn’t want black pilots and now they’re saying ‘we want these black pilots to protect us and fly us back home,’” Richardson said. Richardson told students that although there were some who questioned him when he first decided to become part of the Tuskegee Airmen and work for a government that had a history of enslaving African-Americans, Richardson said it was his country too and he simply wanted to get his fair share. Richardson said he also wanted to prove wrong those had doubts about what African-Americans could and could not achieve.